MICROMEGA M-ONE 150 Review: Life on M.A.R.S.? Martin Pipe gets to grips with French firm Micromega’s M-One 150, an upmarket ‘all-in-one’. Micromega’s M-One 150 machined aluminium case has a low profile, with bright monochrome displays set into the front and top panels. Inside sits 150 Watts per channel of Class A/B amplification supported by twin switch-mode power supplies; the amp gets warm in use. 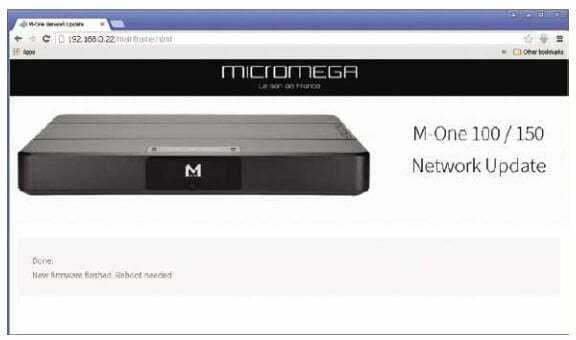 Within its modest dimensions, Micromega has managed to cram in a fairly impressive array of features. A CD transport may be absent, but the M-One 150 is endowed with a phono stage that handles MM or MC cartridges, line inputs (XLR and phono), three digital inputs (coaxial, optical and AES/EBU), a USB port for computer DAC use, Bluetooth and an Ethernet connection that enables the unit to play music stored on networked devices. The M-One 150 is compatible with DSD (as high as 11.2MHz,or DSD256) as well as PCM (all the way to 32bit/768kHz) material. A 3.5mm rear socket accepts the input from a supplied microphone. It is associated with an internally- developed M.A.R.S. (Micromega Acoustic Room System) RoomEQ feature that, in addition to higher power output, delineates the M-One 150 from its physically-identical M- One 100 brother. To provide digital room equalisation all signals, including analogue inputs, are converted to digital through an ADC, a system used in home-cinema AV receivers, Micromega’s RoomEQ function being similar in the way it is set up. Also on the M-One 150’s busy rear panel – which is not labelled – is a pair of USB sockets, but they’re only for update purposes and can’t play music contained on storage media. There are also two HDMI sockets – but these are proprietary I2S digital audio links for other Micromega gear. The M-One 150 can drive an active subwoofer and also has preamp outputs, which lurk in balanced XLR form between the loudspeaker binding-posts. There’s a barely-visible front-panel 3.5mm headphone socket that – with yet more Micromega magic – can be given a binaural sheen. Plenty of connections, arranged into logical groups. They are however awkward to get to, being recessed and bunched together. Furthermore, they’re not labelled – and Micromega has used HDMI-type connectors for its incompatible I2S digital inputs. of the slab-like remote control handset only cover input selection, volume, muting, what information is displayed – and standby. Setup functions require buttons that are set into the top of the unit, on either side of the display. There is however the Micromega M-One app (Android/iOS), which is simple but effective – and, in my case, essential as the M-One 150 remote happened to operate my Cambridge CXN v2 streamer too! Some of the M-150’s internal operating system (’firmware’) can be upgraded over the network. Updating the core firmware – which we tried in a last-ditch attempt to get M.A.R.S. working on the review sample – involves copying the downloaded file to a USB stick. This is transported to one of the M-150’s rear-panel USB ports. (described by the app as a ‘local Tenderer’). This combo worked fine with MP3, CD-derived FLAC and hi­res 24-bit PCM material, but DSD tracks introduced to the M-One 150 via the uPnP network route were flagged on the front-panel as ‘ 192kHz (PCM) and either stuttered or refused to play outright – a ‘network’ firmware update, performed over a web interface, made no difference (transcoding was switched off on my media server). Could it be that DSD is exclusive to the USB port (Windows drivers from the Micromega website)? Another problem I had related to M.A.R.S. I couldn’t get it to work at all. The REQ option wasn’t there on our review-sample. Updating the firmware didn’t help. A shame, as I was looking forward to comparing the difference in sound presentation that it makes. Micromega’s remote handset has an excel- lent range and is machined from a solid block of aluminium. The buttons are tiny and can’t access certain functions – setup- related ones, for example. They are at least labelled, though. An alternative is Micromega’s free M-One app for Android or iOS – you’ll need a smartphone with DLNA app, if you want to try the M-One 150’s worthwhile network playback. while the sterling efforts of vocalist David Byrne lost nothing in terms of their unique character and delivery. An ability to convey atmosphere, depth and organic tonality also made the electronica of Mogwai’s Remurdered (Rave Tapes, 24/96) a joy to listen to. One of my favourite classical recordings of recent years, conductor Gianandrea Noseda and the London Symphony Orchestra performing Britten’s War Requiem (24bit) was rendered with a naturally-expansive stereo image. The bold dynamics of this brooding piece fall well within the M-One 150’s capabilities, yet the subtleties – low-level instruments, and individual singers within the Eltham College Choir and London Symphony Chorus, could be singled out. Bluetooth may lack the ultimate fidelity, but it’s easy to use and has practical (i.e. party) ‘sound reinforcement’ applications. And analogue? Initial vinyl listening was marred by a faint ‘buzzing’ that wasn’t down to any earth loop. Much head-scratching followed, until the turntable was moved away from the M-One 150.1 then got clean and detailed playback of my LPs. There I found that the bass synth of Kool and the Gang’s Street Kids may be tight, but lacks impact. 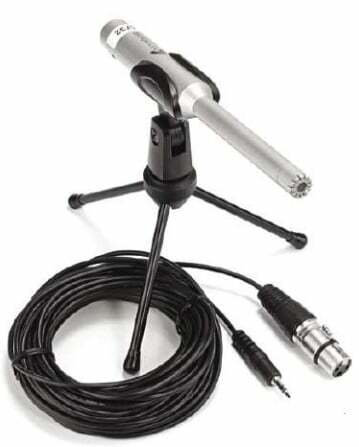 This condenser microphone, complete with tripod, is an essential element of the M.A.R.S. (Micromega Acoustic Room System) RoomEQ feature that is built into the M-One 150. Unfortunately, M.A.R.S. didn’t work on our review sample. Ommadawn, and here the M-One 150 came across as insightful; I could make out the individual instrumental layers that Oldfield had so carefully assembled. On the whole, the M-One 150 has much to recommend it – I can imagine that my problems with M.A.R.S. and DSD playback were down to issues with our early and seemingly incomplete review sample; if not, perhaps firmware updates will save the day. There are some annoyances – for example, top-mounted buttons and a lack of labelling – but they are more than outweighed by a solid and energetic performance and a spread of sensible features. Our Globe rating assumes the review product is an unrepresentative early sample, M.A.R.S. RoomEQ being avail­able and effective in final production. 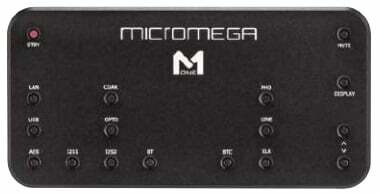 The Micromega M-One 150 measured 162 Watts into 8 Ohms and 290 Watts into 4 Ohms – just above that quoted. Damping factor was 49. It’s powerful and will deliver controlled bass. Distortion was low at 0.01% from low power to full power (1kHz), into 4 Ohm and 8 Ohm loads (via Line in). At 10kHz, 1 Watt (a measurement of crossover distortion) the figure was again low at 0.02% – as our analysis shows. The M-One is a low distortion design. Frequency response (Line in) measured flat from a low 2Hz up to 30kHz into 8 Ohms and 4 Ohms, cutting off sharply at 48kHz, our analysis shows, due to 96kHz sample rate internal processing. Input sensitivity was very low, 1.7V for unbalanced input where 0.3V is common, and 1.6V for balanced (XLR socket) inputs, with Sensitivity set at 0dB. Setting Sensitivity to -f 6dB made no difference, so no extra gain is available, but setting to -6dB halved gain – this function did not work properly on our sample. These inputs suit silver disc players only (2V output), not low gain external Phono stages or such like. Input overload margins were low for CD, measuring 1.8V where 2V is needed and 3.5V at XLR socket line in where 4V is needed. Measuring the ADC-DAC loop from XLR in to XLR (Preamp) out, at -60dB in (3.5mV), EIAJ Dynamic Range was a respectable 105dB. Distortion was low at 0.12%, making this a relatively high quality digital conversion system, albeit of 48kHz bandwidth. Frequency response of the Phono stage was dominated by an IEC warp filter that rolled off gain below 80Hz, measuring -1 dB at 50Hz, on both MM and MC. This is severe, rarely used because it audibly lightens bass from LP. Sensitivity of MM was very low at 15mV (5mV is normal) and overload just satisfactory at 32mV; similarly MC was low: 1.6mV and 3mV. Low gain gives low conventional noise figures relative to full output (MM -93dB, MC -82dB) but equivalent input noise (ein) of 0.3 muyV for MM and 0.12 muy V for MC were good if unexceptional. Hiss is not an issue; the phono stage is relatively quiet. The electrical (co-axial) and optical digital inputs (S/PDIF) both accepted 192kHz sample rate PCM, frequency response measuring flat to 30kHz (- 1 dB) before roll off to a sharp 43kHz limit. Distortion from 24/96 hi-res PCM measured a reasonably low 0.04% (CD 0.22%) whilst EIAJ Dynamic Range was on the low side at 114dB with 24bit where 115dB or better is common. The balanced AES/EBU XLR-socket input gave identical results to optical and electrical (coaxial) inputs. The digital performance was unexceptional. The M-One has limitations, including very low input sensitivities (low gain), low overload margins and a phono stage with weak bass. Digital dynamic range was mediocre and RoomEQ unavailable for measurement on our sample. Improvement is needed. Potent package spoilt by sillies.